This is the page for Tom Higgins, Professor, Criminal Justice and Paralegal Studies. I was once an ICC student. 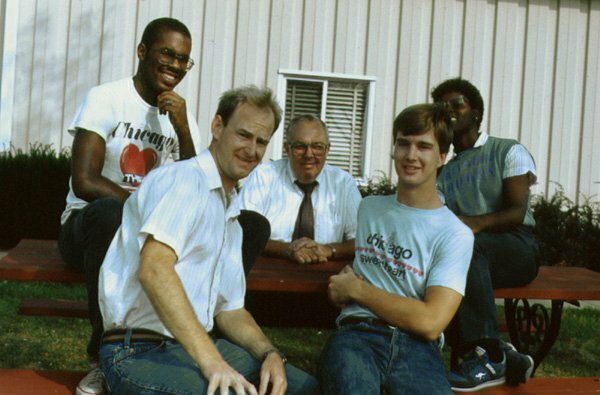 That is me, wearing the light blue t-shirt, circa 1984 outside Dirksen Hall at the former Dingeldine Campus of Illinois Central College. The gentleman seated in the center of this group of now retired or near retired public servants is our teacher and mentor, Roy "Doc" Wright. Doc is the person responsible for founding or facilitating all of the Public Services programs formerly or currently offered at the college. My office mate and Criminal Justice Internship co-instructor, Professor Graff, is also an ICC and Doc Wright disciple. Professor Graff and I and all ICC Public Services faculty and staff hope to honor Doc Wright by bringing the same level of passion he had for our programs and courses and we work hard to give you the same effort he put into seeing us succeed. If you have a question about our programs or one of my courses, don't hesitate to contact me. The most efficient way to reach me outside of class or office hours is via e-mail at: thiggins@icc.edu. 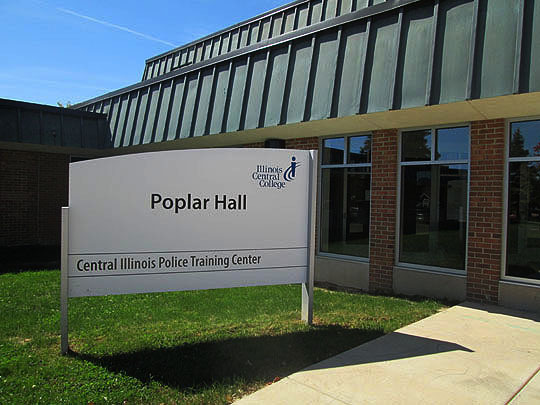 My assigned office is Room 116 of Poplar Hall, at the Peoria Campus. My office phone (309-690-7693) rings to my cell phone. If I do not answer, please leave a message and I will return your call as soon as I am able to do so. If I am not in my office, I may already be assisting a student so check the classroom listed below. *Virtual Office Hours are conducted with one or a combination of online, e-mail or by telephone. Also gained valuable on the job experience in various criminal justice and law related positions while earning my formal education prior to 1990, including: Illinois Central College Public Safety (now Campus Police); Northwestern University Police Department; working for Chicago law firms; Research Assistant to John Marshall Law School Dean Gil Johnston; and the Illinois Attorney General's Office, Criminal Appeals Division. Various Continuing Legal Education program materials for Peoria County, Illinois State Bar Association and private CLE provider programs. Do YOU have what it takes to be a PARALEGAL?